True story: I was sitting in a restaurant in my hometown of Foam Lake with my parents when out of nowhere, my dad looked up and pointed out an acquaintance who took swimming lessons with me when we were kids. "You know you're related to him, right?" A minute later, he pointed out someone who was a grade behind me in school. "We're related to her, too." So I'm not exaggerating when I say that there's probably a good chance that I'm somehow related to the guys from the band Foam Lake. The four Ross brothers — Paul, Barrett, Tyler, and Kalen — aren't from the town itself, but they're familiar with the area because their mother grew up there and their grandparents (who, incidentally, my Baba knew) lived there, so the name seemed like an obvious choice. "As kids, we really respected our grandparents and we're all members of the same family, so it just kind of made sense," Barrett says. All four brothers live in Saskatoon. 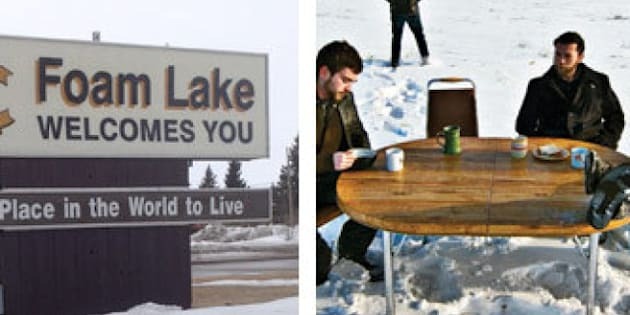 The town of Foam Lake (population approximately 1, 400, but with no actual lake) is located in east-central Saskatchewan, a few hours away from Saskatoon. It's known for a variety of disparate things: hockey players like Bernie Federko, the Quill Lakes to the west (the largest saltwater inland body of water in North America and home to many endangered birds), and the Breast Friends, who produce cookbooks that raise money for cancer research. Tellingly, when I ask the brothers what their favourite part of Foam Lake was when they were younger, there's a pause. Kalen mentions the water tower (which is the town's logo), and Barrett brings up the theatre (which no longer exists). That's not to say that it was boring growing up there. I grew up on a farm and one of my favourite childhood memories was when my father got my siblings and me to burn stubble (controlled burning of crops, usually flax, for the purpose of clearing the field) with a blowtorch while sitting in the back of a truck. Then there was the time my brother and I went offroading and got stuck. To avoid our father's wrath, we tried to sneak out the tractor to pull the truck out. It might sound like fun and games, but it has its hazards. Like the rooster straight out of a Stephen King novel who harassed me so much that I had nightmares and my parents had to execute it. Or the time I almost hit a cow while driving to school. When I meet up with the brothers, we spend a few minutes playing the "Small Town Game" — namely, trying to find people we have in common. We come up with two hits and, in addition, it turns out they're related by marriage to my high school history teacher. The brothers recall playing in Los Angeles once and meeting someone who knew someone from Foam Lake. Prior to forming Foam Lake, two of the brothers were in a band called Bloodlines, while the other two were in The Warbrides. When those two bands dissolved, the brothers decided to form their own band. One might think it would be difficult working with your siblings, but for Foam Lake, it's worked out. "We don't have wayward members that go off and do stuff. We're not worried about one of us disappearing on a coke binge," Paul says. When asked to compare themselves to other bands that have brothers, Paul jokes that "It would easily be Hanson" but then settles on Oasis, because "We fight like Oasis." On a more serious note, Paul says that being from the same family keeps them grounded and helps them feel supported. I met the brothers at the Wheat Sheaf Tavern at Toronto's King and Bathurst area. I'm not sure if they chose the location because it was convenient or just because it was the most prairie-sounding tavern in the city. Despite assurances that they fight a lot, they seem to get along. Albeit, with brotherly jokes at each other's expense, like when Barrett says that Kalen needs a haircut, or Paul accuses Tyler of stealing his soup. Although Paul admits that sometimes "stronger wills do prevail," the band is a democracy, with each member sort of having his own domain — like dealing with press, the record company, or the website. "We try to get everyone doing stuff," Paul says. "Ultimately, no one has a dictator say on anything." Saskatoon is a small city, but the brothers don't feel that has hurt their band's career. They say that it has a lot more creative people than one might expect, and artists have a lot of support from organizations like SaskMusic. "We're sitting pretty in Saskatoon. Living in Toronto, we'd have to start over," Barrett says. Another advantage of being from a smaller place is the fact that other people are often fascinated by where they're from. "When we were in Europe, we told people where we were from, and they're like, 'You're from what? Where? Do you guys have indoor plumbing?'" Barrett says. "People seem automatically interested if you're from somewhere like that." As someone who has had to explain that Saskatchewan has the internet and automatic doors, this is not an exaggeration. Before I leave the Wheat Sheaf Tavern, we make up a special Foam Lake handshake, which Barrett greets me with when I see him the next day at the showcase. But I can't tell you how to do it. It's for Foam Lakers only. And then the brothers hit the road right after their gig because Barrett had to work on Monday morning. Good thing it was just a 32-hour drive back to Saskatoon.